This print honoring those who served in Vietnam is a stunning piece of art. Hero’s Bridge will award this signed, numbered and professionally framed limited edition giclee on canvas. The art is valued at $1,400 and Hero’s Bridge will only offer 250 tickets for this award. The drawing will be held on December 15, just in time to make this a beautiful Christmas gift for yourself or a loved one. “Line of Duty” is a ravishing piece of artwork created by Rod Chase. 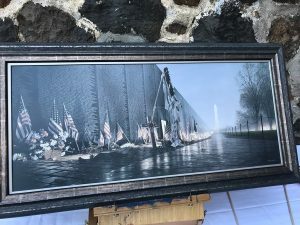 This is an angelic, exquisite work of art featuring the Vietnam Veterans Memorial Wall and honors the men and women who were killed and who are missing from the war. 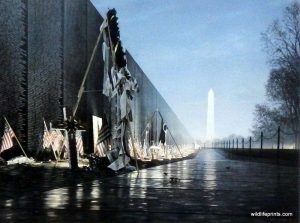 The Washington Monument is highlighted in the background and the artist captivates the viewer with an array of colors and imagery from the waving flags to the crosses placed all along the wall. The graceful strokes of Rod Chase’s brush allows his audience to feel the pain the families experience over the loss of their loved ones. Rod Chase is a photorealist painter, and this particular piece of work pays tribute to the Vietnam War and was released in October of 2003. This certified signed and numbered print is 14.5 inches tall x 34 inches wide and it is custom framed by Framecraft. The canvas is double framed or “stacked”; the inner frame silver and the outside frame is blue-silver. To purchase a ticket for this piece of art, please visit Hero’s Bridge at one of it’s upcoming events, email us to arrange payment, visit Deja Brew Cafe (in Warrenton, VA), or purchase online. Single tickets cost $20 each, or you may purchase five (5) for $100. Thank you for supporting our aging veterans through the purchase of your ticket(s). Korean War Veteran John E. King Jr.